On 19 November 2015, U.S. Senator Paul Strauss, U.S. Senator Michael D. Brown and U.S. Representative Franklin Garcia will host a ‘Welcome Reception’ for the Unrepresented Nations and Peoples Organization (UNPO), at the Circle Bistro of the One Washington Circle NW, in Washington D.C, between 17:00 and 19:00 Eastern Time. The UNPO will be represented by its President, Mr Nasser Boladai and by Ms Johanna Green, UNPO Program Manager. 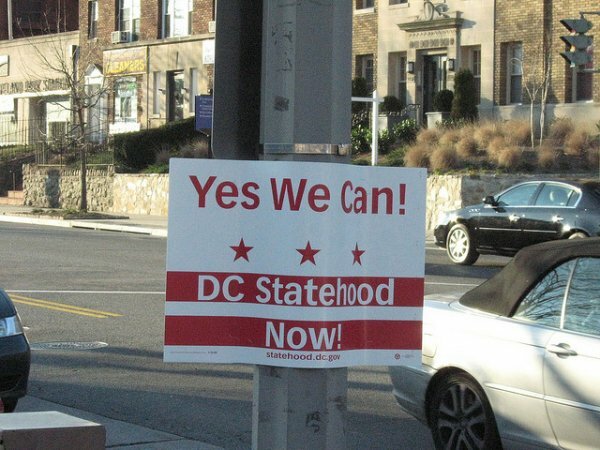 On the same day from 12:30-1:45 PM [19 November 2015], come join the new UDC-DCSL Chapter of the Students for DC Statehood (SDCS) to discuss the importance of statehood and representation on a local and international level. The event will take place at the UDC Law School located at: 4350 Connecticut Ave., NW, Room 509. Our speakers, UNPO President, Nasser Boladai, and DC's own Senator (Shadow), Paul Strauss, will discuss the common struggle that is the continued denial of statehood and how you can get involved! The Welcome Reception follows New Columbia’s inauguration as UNPO’s newest member as of 7 November 2015. This is the first visit of UNPO officials to DC following the district’s admission to the organization. The acceptance of New Columbia as a member came in recognition of the district’s lack of self-determination, as the US Congress has to approve every piece of local legislation before it can enter into force, as well as due to a lack of voting representation in the national legislature with unequal weight in Presidential elections. DC and the other members of the UNPO are all united by one shared condition – they are not adequately represented at major international fora, such as the United Nations. As a consequence, their opportunity to participate on the international stage is significantly limited, as is their ability to access and draw upon the support of the global bodies mandated to defend their rights, protect their environments, and mitigate the effects of conflict. Mr Boladai and Ms Green, who arrived in Washington D.C. on Sunday, will be in the capital for the rest of the week. The mission was planned to raise awareness of the situation of the Baloch community in both Iran and Pakistan, where they face serious human rights violations. Nonetheless, following the admission of DC as a UNPO Member, their programme was adapted to include meetings with relevant political and community leaders. This includes, among others, an interview with local TV network, D.C. Statehood Today and the above-mentioned lecture, which Mr Boladai and Ms Green will be giving at UDC Law School from 12:30 to 13:45 on 19 November.